In the previous part of this tutorial, we used Diffbot to set up a crawljob which would eventually harvest SitePoint’s content into a data collection, fully searchable by Diffbot’s Search API. We also demonstrated those searching capabilities by applying some common filters and listing the results. 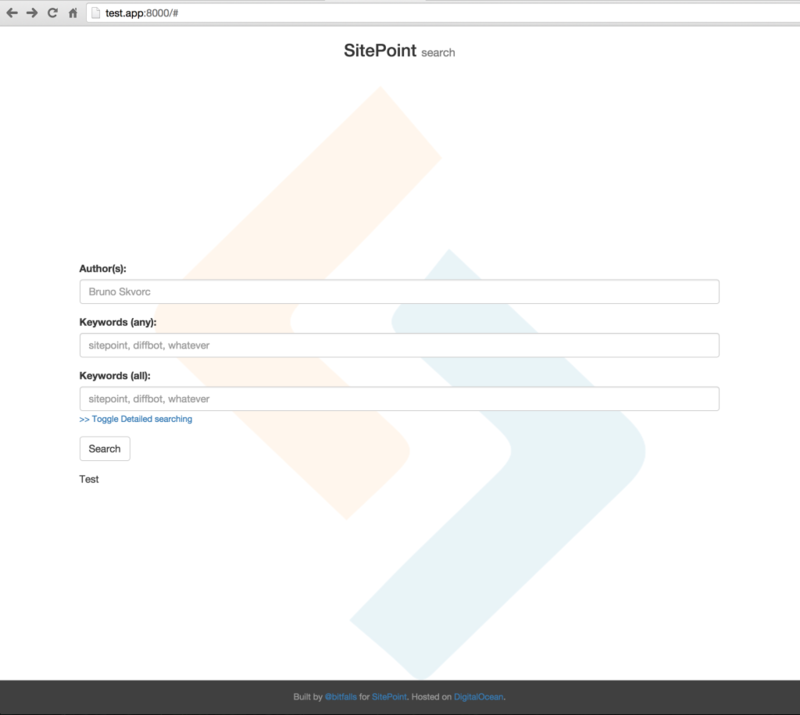 In this part, we’ll build a GUI simple enough for the average Joe to use it, in order to have a relatively pretty, functional, and lightweight but detailed SitePoint search engine. What’s more, we won’t be using a framework, but a mere total of three libraries to build the entire application. You can see the demo application here. This tutorial is completely standalone, and as such if you choose to follow along, you can start with a fresh Homestead Improved instance. Note that in order to actually fully use what we build, you need a Diffbot account with Crawljob and Search API functionality. Moving on, I’ll assume you’re using a Vagrant machine. If not, find out why you should, then come back. installs BowerPHP globally, so we can use it on the entire VM. creates the project’s root folder and several subfolders. installs the Diffbot PHP client, which we’ll use to make all calls to the API and to iterate through the results. installs VarDumper in dev mode, so we can easily debug while developing. I also used iconifier to generate some icons, and grabbed a big SitePoint logo image to use as the site’s background, but that’s all entirely optional. Then, we add this file to the project’s .gitignore file. Feel free to use this one and update it as needed. This is so we don’t accidentally commit our Diffbot token to Github – a stolen token can become very expensive. Bootstrapping done, let’s get to the meat of things now. “Keywords (any)” will search for any of the given keywords in any of the Diffbot-extracted fields. This includes body, title, meta, even author, etc. “Keywords (all)” searches for keywords, too, but those must all appear across any of the Diffbot extracted fields. Let’s update our home.twig file, inspired by HTML5 boilerplate. <input class="form-control" type="text" name="q" id="q"
<input id="submit" class="btn btn-default" type="submit"
Note that I also extracted some tedious bits of HTML into sub-templates that get included. Those include the Google Analytics snippet, the modal with search query examples, and most importantly, the results template which we’ll use to output results later. Only the results one is important, so make the file template/twig/results.twig, even if it’s empty or just has the contents “Test”. The others can be removed from the home.twig template altogether, or you can grab them from the Github repo. There is one main search field, similar to Google, which accepts any keyword or phrase constructed in a Search API friendly way. Think of it like direct access to the Search API. See the examples modal for what it’s about. By clicking on “Toggle Detailed”, however, the situation changes and we have our individual search fields with which we can get more precise results. Let’s wire these fields up now. For the purpose of cleaner code, we abstract the query building mechanics into a brute-force SearchHelper class. 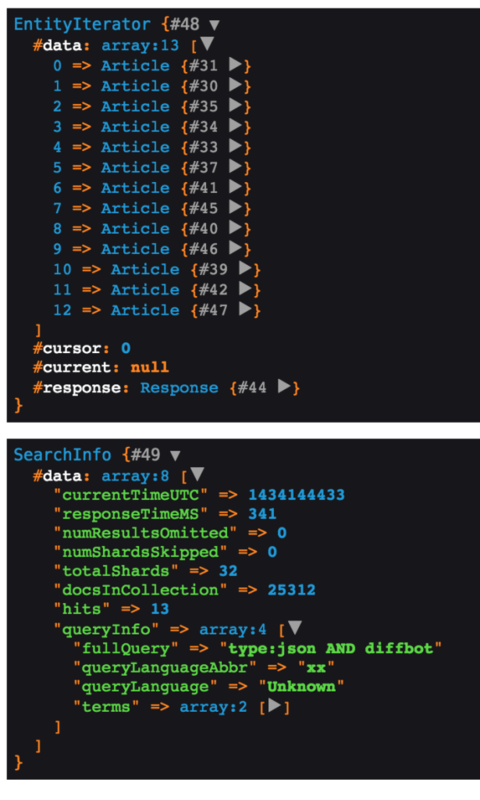 The method stringFromParams calls some sub-methods which look for some predefined array keys in the array of params passed in, and use them to build a Search API compliant query string. For simplicity’s sake, I included only an author and keyword check in this tutorial. After editing an autoload block, we need to update the autoloader with composer dump-autoload. So far, we have query-building functionality and the search form. Let’s test and see if we get some results back. getting this data printed nicely in the template. letting users navigate through pages, in case more than 20 results are returned. Then, we edit the results.twig template. We also need to add the media object styles to our CSS. Note: Some of the results are duplicated due to different live links leading to the same resources (redirects). This is a temporary Search API limitation, and can be resolved by manually cleaning dupes out until Diffbot’s development team adds a fix. To add pagination, we need the total number of hits, and the number of results per page. If we know the current page, we can then easily calculate everything else. To implement pagination, we do the following. The first two IF blocks render the first and last page links, or show them as disabled if the user is already on the first page. 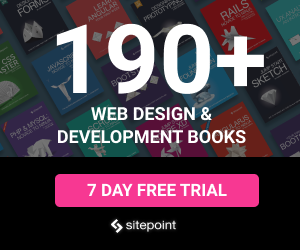 The loop in the middle goes through a range of pages and renders them – several before the current page, and several after, also known as “sliding pagination”. The last two blocks render the “next page” and “last page” links, respectively. Largely inspired by a similar implementation from KnpLabs, this class assembles the array of paginationData required to make the pagination controls work. Go through it if you’re interested in what it does – it’s quite straightforward, but if not, let me know and I’ll try to explain. This is because the misc non-conditional query values like sortby (see documentation) can’t be boolean-linked, ergo, cannot have AND before them, else results become unpredictable. They must be separated from the query string via whitespace. 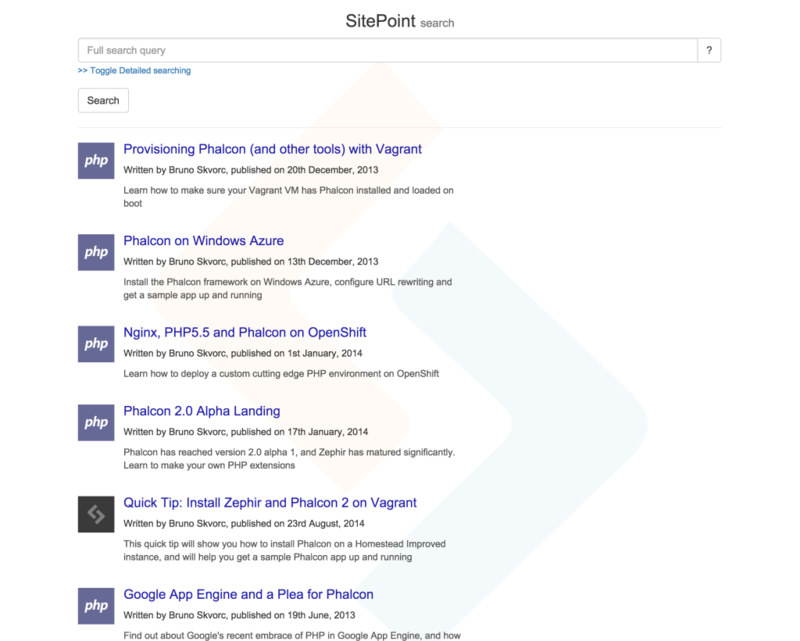 In this standalone part 2 of our SitePoint Search Engine tutorial, we built a simple search GUI for crawled SitePoint article data, making the entire site’s library instantly searchable across many fields. We learned how easy it is to quickly start new projects, and seen how effective tools like Twig and BowerPHP make us – all without the need to pull in whole frameworks. I’ll be making gradual improvements (including the above) to the app in the near future as I partially integrate it into another application, so stay tuned and keep checking in! We’ll even deal with some of these upgrades in future tutorials, so if the app doesn’t look like it does in the screenshots of this tutorial when you access it here, it simply evolved. There’s always the original 0.1 version you can clone to get this exact copy.